Love it or hate it, the Disney Dining Plan is one of the most controversial and most talked about options when it comes to booking a Disney vacation. But did you know that there are ways to truly maximize every single dollar you spend on this plan, and then some? It’s true! Plus, if done correctly, there are ways for you to essentially be getting meals at a ridiculous discount! Below, you’ll have exclusive access to some in-depth guides that will truly help you make the most out the Disney Dining Plan while also learning some pretty killer tips, tricks, and secrets that’ll make your dining experiences more magical, tasty, and affordable. So with that being said, let’s jump straight to the guide! Here are some surefire tricks, tips, and helpful advice to help you maximize your Disney Dining Plan credits at both table service and quick service restaurants. Trust me, these tips can help you save you hundreds of dollars! Here are some of the best ways to maximize your Disney Dining Plan credits at table service restaurants, including character dining and signature restaurants. Because hey, let’s face it, you’re paying top dollar for these DDP credits. Let’s not let them go to waste. Here are some of the best ways to maximize your Disney Dining Plan credits at quicks service and counter restaurants at both Disney resorts and parks. In this post, you’ll discover some of the best (10 to be exact) snacks that will definitely help you maximize the Disney Dining Plan. Because hey, who wants to spend their Disney Dining Plan snack credit, which is worth $5, on $3 bottles of water and $2 cookies. There are just so many more options for you to enjoy! And we’ll show you exactly which irresistibly delicious snacks will get you the most bang for your buck. 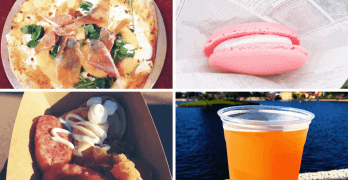 Did you know that there are ways to get more food at Disney World than what you paid for? Yes, it’s possible! You are paying around $63 dollars a day for this plan (if you’re on the basic plan which is the most popular). That’s why it’s your duty to make the most of it and get the most bang for your buck. In this guide, you’ll learn just how to become a Disney Dining Plan pro! Here are over 31 sure tips, tricks, and little known secrets that will help you make the most out of the Disney Dining Plan. Whether if it’s saving money or finding the best restaurants to use your credits at, you’ll discover some valuable insights in this in awesome resource. And be sure to say hi to me on Instagram which is where I post Disney tips, food recommendations, and more!